According to K-Laser’s website, K-Laser Therapy “is an FDA cleared therapeutic treatment that manages pain and inflammation while accelerating tissue regeneration. Laser energy increases circulation, drawing water, oxygen, and nutrients to the damaged area. This creates an optimal healing environment that reduces inflammation, swelling, muscle spasm, stiffness and pain.” Simply, specific wavelengths of light are utilized to create therapeutic effects. In addition to the above benefits, a big advantage of Pet K-Laser Therapy is in reducing discomfort in dogs and cats suffering from conditions that limit the use of medications, such as some heart and liver diseases. K-Laser Therapy also complements other treatments and can be used when paired with other pain management techniques such as acupuncture, massage, supplements and, if tolerated, medication. If K-Laser Therapy is recommended for your pet, it is important that the treatment be given by a trained veterinarian or technician, such as the talented practitioners at Breckinridge Park Animal Hospital. Many different factors go into calculating a treatment plan. Although home kits are available for purchase, when used incorrectly or over used, these kits can cause more harm than good. In addition, an untrained pet owner may not know what conditions should not be treated with Pet K-Laser Therapy, such as pregnancy and tumors. The Pet K-Laser Treatment is non-invasive and can be completed in an easy office visit. First, the Richardson veterinarians at Breckinridge Park Animal Hospital will do complete physical exam and evaluation. Next, a treatment protocol, outlining the number of laser treatments, the type of laser, and the duration of each treatment will be formulated. During the treatment, everyone in the room—veterinarian and/or technician, animal and pet owner, if present, will wear eye protection. Shaving the area to be treated is not required, nor is sedation. The laser wand is then moved over the area to let the laser do its magic over the affected area. This generally takes about 10-20 minutes. 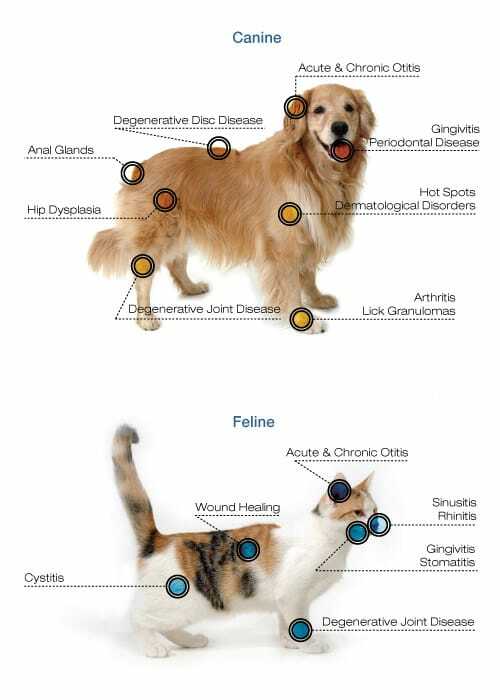 There is no discomfort to the dog or cat as the laser is “cold”. Afterwards, it is always practical to monitor your pet for any symptoms, and notify Breckinridge Park Animal Hospital of any concerns. It is normal for your pet to appear less active due to relaxation from the treatment, or, if there is a large, beneficial, reduction of pain and inflammation, more physically active. 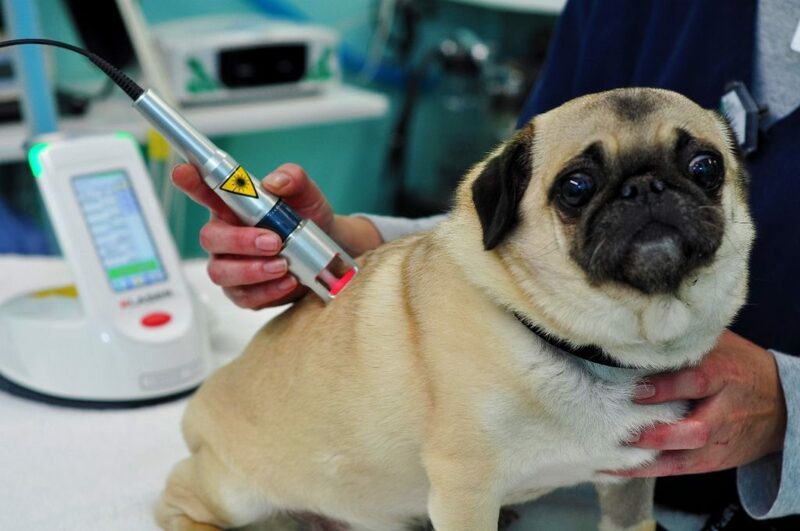 The risks of Pet K-Laser Therapy are very few, with one being the risk of burning. However, veterinarians and technicians use laser equipment that minimizes this risk, and are also trained in protecting your pets from harm. This is another reason to trust this procedure to one of the experts at Breckinridge Park Animal Hospital and not rely on a home kit. If your pets are experiencing discomfort, you may want to find out if they can benefit from K-Laser treatments. Contact one of the best Richardson Veterinarians at Breckinridge Park Animal Hospital Call the office at 972-690-6900 to make an appointment today. The friendly and caring staff will implement the best course of action to alleviate pain, inflammation and other uncomfortable conditions in your dog, cat, or other furry friend.